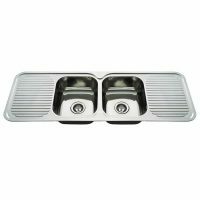 Add a modern touch to your kitchen with this stylish Everhard ‘Squareline Plus single bowl with drainer’ Undermount Kitchen Sink. 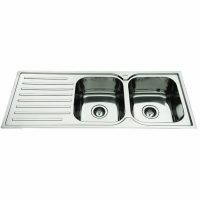 This popular sink has been designed to be installed either as an undermount or top mount. While it is proportioned to suit standard modular kitchens cupboard and draws, it is also sophisticated enough to fit any custom kitchen cabinetry. Style aside, this kitchen sink is also incredibly practical. 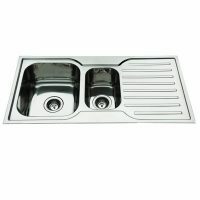 It is 870mm long, 440 wide and 200mm deep, with a bowl capacity of 34.4L. 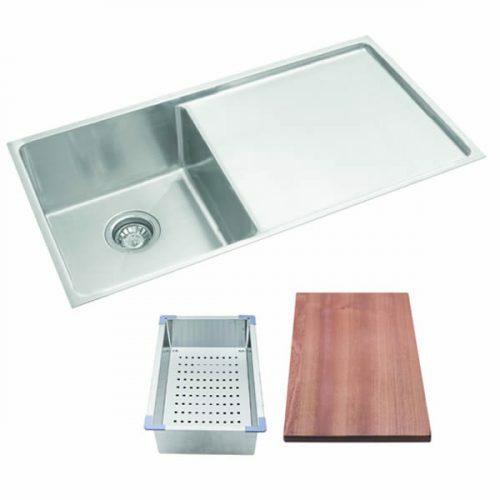 Also included with this kitchen sink are a wooden chopping board, a stainless steel colander and two 90mm basket wastes. Thanks to the 10mm radius of internal corners, this sink is incredibly easy to clean as well. The Squareline Plus single bowl is manufactured to the highest quality from a 1.2mm sheet of stainless steel with a 304 grade. Its brushed finish adds to its stylish looks. Everhard backs this product with an impressive 25 year guarantee on stainless steel bowls and a 1 year guarantee on all wastes, plugs and accessories. Making your kitchen look modern is easy with this Squareline Kitchen Sink from Everhard. Buy it online today from Ross’s Discount Home Centre for free Metro Shipping in Perth.